Thank you to the Pennsylvania Coalition of Nurse Practitioners for their recent endorsement for the Office of the National Nurse initiative. The Pennsylvania Coalition of Nurse Practitioners (PCNP) is pleased to support your efforts and endorse the Office of National Nurse. PCNP represents the interest of over 6,800 nurse practitioners (NP) throughout Pennsylvania. Our organization is committed to improving access to care and removing barriers to practice for advance practice nurses. 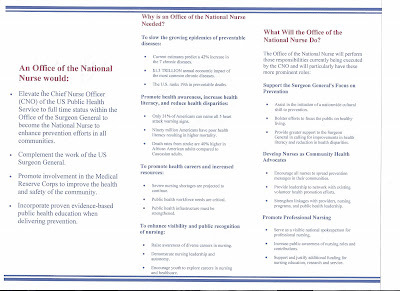 The NP profession takes pride in its expertise and focus in the areas of health promotion and disease prevention, By directing our legislative initiatives on issues that advance the cause of safe, quality patient care, we strongly believe our contributions will have a positive impact on the health and wellness of our state and country. We believe and strive to support that our health care system should serve everyone and utilize nurses to the full extent of their education and clinical expertise. PCNP supports the concept of creating an Office of the National Nurse and feels this position will further support the mission of PCNP. We believe that elevating the Chief Nurse Officer of the U.S. Public Health Service to full-time status and renaming this position as the National Nurse is a way to promote the visibility of nurses in the national health care debate and give nurses another voice at the federal policy table. Thank you for all of your efforts and we wish you continued success with your initiative. "The mission for the proposed office is to establish symbolic national leadership by elevating the current USPHS post (Chief Nurse Officer) to a level of high visibility to the nursing profession and the public, to complement the work of the U.S. Surgeon General, to promote involvement in the MRC to improve the health and safety of the community, and to incorporate proven evidence-based public health education in implementing prevention strategies. The importance of the prestige implicit in the concept of a national nurse is part of the reason the campaign seeks to grow the office from the current USPHS chief nursing officer role. The position already is aligned to work directly with the office of the Surgeon General and is reputable among public health nursing leadership." To read the story in its entirety click here. 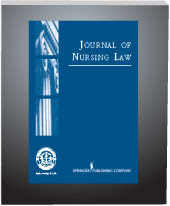 Volume 13, Number 1, 2009 of Journal of Nursing Law includes a manuscript, "The Office of the National Nurse", written by NNNO President Teri Mills MS, RN, CNE and Secretary Alisa Schneider MSN, RN. An abstract is now available on line accompanied by instructions on how to order the full text electronic version. Editor in Chief Suzanne Edgett Collins, RN, MPH, JD, PhD and Assistant Editor Diane Kjervik, JD, MSN, RN, FAAN eloquently write in their editorial, "Mills and Schneider, as founders of the movement to establish an Office of the National Nurse, address the challenging crises that our national health system faces and promote the establishment of the an Office of the National Nurse. They argue that the Office of the National Nurse is a fundamental, necessary change in the traditional thinking about professional nursing's role in health promotion and disease prevention on a national level." Collins, C. & Kjervik, D. (2009). In a time of challenge and change, nurse attorneys provide leadership (Part II). Journal of Nursing Law. Volume 13, (1), pp 3. The following press release provides more evidence as to why we need an Office of the National Nurse. The public supports prevention and is willing to pay for it. Washington, D. C. – Trust for America’s Health (TFAH) and the Robert Wood Johnson Foundation (RWJF) released a new public opinion survey today which finds that Americans rank prevention as the most important health care reform priority, and overwhelmingly support increasing funding for prevention programs to reduce disease and keep people healthy. In the poll, conducted by Greenberg Quinlan Rosner Research and Public Opinion Strategies, 70 percent of Americans ranked investing in prevention between an eight and 10 on a scale of zero to ten, where zero means not at all an important health care priority and 10 means very important. Forty-six percent rated prevention as a 10 out of 10. Overall, prevention was rated higher than all other proposals, including providing tax credits to small businesses and prohibiting health insurers from denying coverage based on health status. More than three-quarters of Americans (76 percent) support increasing funding for prevention programs that provide people with information and resources and creating policies that help people make healthier choices. Investing in prevention is popular across the political spectrum, with 86 percent of Democrats, 71 percent of Republicans, and 70 percent of Independents supporting investing more in prevention. “We know that strategic investments in disease prevention programs in communities can result in a big payoff in a short time -- reducing health care costs, increasing the productivity of the nation’s workforce, and helping people lead healthier lives,” said Risa Lavizzo-Mourey, M.D., M.B.A. president and CEO of the Robert Wood Johnson Foundation. While Americans believe that prevention will save money (77 percent agree with the statement that “prevention will save us money”), they strongly support prevention regardless of its impact on costs. Rather, they point clearly to keeping people healthy as the best reason to invest in prevention, with 72 percent agreeing with the statement that “investing in prevention is worth it even if it doesn’t save us money, because it will prevent disease and save lives.” Additionally, 57 percent agree more with the statement “we should invest in prevention to keep people healthier and improve quality of life” than the statement “we should invest in prevention to lower health care costs” (21 percent). Americans believe the nation needs to put more emphasis on prevention (59 percent) rather than thinking there needs to be more emphasis on treatment (15 percent), by nearly a four to one ratio. This represents a significant shift toward prevention over the last two decades -- in 1987, only 45 thought there should be greater emphasis on prevention. The poll, which reflects the responses from 1,014 registered voters, was conducted by Greenberg Quinlan Rosner Research and Public Opinion Strategies from May 7 to 12, 2009, and is available at http://healthyamericans.org. The margin of error was +/- 3.1 percent. Trust for America’s Health is a non-profit, non-partisan organization dedicated to saving lives by protecting the health of every community and working to make disease prevention a national priority. http://healthyamericans.org. The Robert Wood Johnson Foundation focuses on the pressing health and health care issues facing our country. As the nation’s largest philanthropy devoted exclusively to improving the health and health care of all Americans, the Foundation works with a diverse group of organizations and individuals to identify solutions and achieve comprehensive, meaningful and timely change. For more than 35 years the Foundation has brought experience, commitment, and a rigorous, balanced approach to the problems that affect the health and health care of those it serves. Helping Americans lead healthier lives and get the care they need—the Foundation expects to make a difference in our lifetime. For more information, visit www.rwjf.org. Pictured is the front and back page of a tri-fold brochure. You are welcome to make copies to distribute to others. The National Nursing Network Organization continues to hear from graduate and undergraduate nursing students who are studying the ONN initiative and wish to obtain more information. We have recently had conversations by phone, email, and through Facebook with students attending George Washington University, George Mason University, University of Pennsylvania, and UC Irvine. 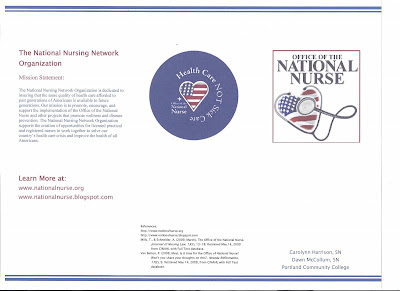 Nurse educators and students from coast to coast believe that the ONN initiative is proactive, timely, sensible, and cost effective with benefits that could be far reaching for the nation. Many are requesting that we explore the possibility of putting on a teleconference during the summer and/or fall that students and others could participate in without having the expense or burden of travel. We have discussed this with those who work in the ITV at Portland Community College and they are enthusiastic about providing this opportunity. ITV is a state of the art educational videoconferencing system integrating several technologies and using equipment that is easy to operate. • Turning on the system simply requires use of a remote control unit to activate a projector. The host has constant, live, visuals of every site. • Pushing a button activates microphones in front of the participants. Participants at the sites see the presenter, other participants, electronic notes, graphics, videos, and other selected images on a large screen. Alisa and Teri presented to nursing students from Santa Barbara City College (CA), Mt. Wachusett Community College (MA), and Portland Community College (OR) two years ago and this was very well received. Please teri@nationalnurse.info if you are interested in participating in an ITV teleconference about the ONN initiative and we will put plans into motion to make this happen.